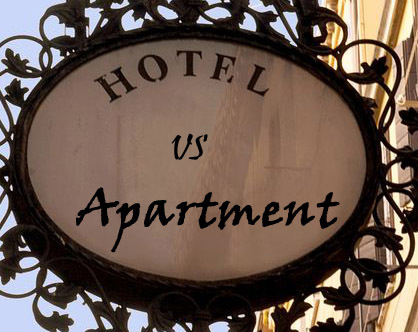 Many people ask why they should consider a serviced apartment over a hotel room. There are various differences of staying in the apartment in Goa and hotel in Goa. Every person travelling has its own views and comfort level when it comes to Goa. Some prefer staying in budget hotels, standard hotels, boutique hotels or luxury hotels wherein, same way apartments too are categorized as standard apartments, semi-luxury and luxury apartments based on the interiors and the amenities they provide. Below are some the differences between apartment stay in Goa and hotel stay in Goa. 1. Staying in hotel is like staying in a small room with a washroom at an nominal cost and you need to book a suite room which has interconnected rooms and are very costly other way, you have to just select the apartment rather it be 1BHK apartments or 2BHK apartments or 3BHK apartments in Goa at a very low cost as compared to hotels. 2. Hotels usually charge on per person basis. In apartment in Goa, you are charged as per apartment. 3. Maximum of the hotels don’t allow their guests to carry outside food and snacks in the hotel Wherein, apartments there are no such restrictions and you can carry food as much as want in the apartment. 4. Anyhow you manage to skip the hotel reception and able to carry your food in your hotel room, you see your small fridge is filled with over-priced drinks and chocolates and hardly place is left for your food and in case of apartments, you have your own king size fridge and you can fit as much food as you can. 5. If you are in a group and staying in a hotel, you need to come to the lobby for meeting or get together and hence there is no privacy for your discussion. If you had to stay in 2BHK apartments or 3BHK apartments, you have a living room where all the guests can come together and have a great time. 6. Apartments in Goa provide kitchen facility which allows you to cook food as per your wish and there are no restrictions, Hotels provide direct breakfast at their restaurant and are as per fixed menu. There is no trouble of cooking your breakfast if you are staying in the hotel in Goa and off the bed you move to the restaurant and have your ready made breakfast. 7. Finding cheap places to have lunch/snacks/dinner in a new city can take time, and finding cheap places to eat lunch near tourist attractions is almost impossible, if you happen to stay in apartment in Goa, you can easily get the basic food amenities and cook it yourself. 8. Laundry service is often a concern if you are staying in a hotel and the hotel charges a lot wherein, Some apartments have a washing machine and dryer in the room, but it’s quite common to have communal facilities for washing clothes. 9. You get a feeling of staying at home when you stay in the apartments in Goa, hotel stay feeling is always different from the home. 10. The most important one, you save a lot of money when you stay in an apartment in Goa and the same money can be used for other purpose when you are on a holiday. Families – If you are traveling with your family, especially kids, a serviced apartment are the best choice. A Lot of apartments are kid-friendly with play area ( Playing Garden). Corporate travelers – If you’re on a business trip, there’s plenty of space for you to work. In hotels, you’ll usually end up working on the bed, which can sometimes be a little bit too uncomfortable to get any work done. Relocation – if you are relocating to a new city, a serviced apartment can be your base till you find suitable accommodation. Then you can take your time to find an accommodation that suits your needs.